You are at an amazing homeschool convention. You’ve planned some shopping time for yourself and you’ve hit that huge vendor hall. You’re walking up and down the many aisles and feeling more than a little overwhelmed. As you pass each booth there are eager hands thrusting brochures at you and questions directed at you. Help! Are these people attacking you? I used to be slightly terrified of them too. Ok, not slightly terrified – totally terrified and utterly intimidated. How did I overcome my fear of vendors? Now that I’ve seen conventions from the other side of the vendor booth, I can approach vendors with confidence. I know exactly how hard they work during each convention. I also know how much they want to help you, the homeschool mom. I loved being a vendor! I got to meet so many amazing homeschool families. I was so blessed by our many conversations. If you’d like, you can read more about my thoughts for vendors and for homeschool moms at a convention. I’ve written a letter to both groups. Ok, so I may have overcome my fear of vendors, but what about you? How do you handle all those eager vendors at a homeschool convention? Don’t be afraid to talk to them. You can approach them with confidence and get information about their product. I greatly appreciated the folks who made eye contact, gave me a smile, and turned down my help in a gracious way. Yes, listen to their information, but be prepared to ask questions. You need to know if their products work for you. So, take charge of that conversation and steer it in a direction that will help you know how their products will fit into your homeschool! One of my favorite parts of being a vendor was fielding questions from homeschool families. Did you know that saying the same spiel over and over gets boring? Nothing is more refreshing than to talk with a homeschool family that is full of questions. I loved getting a glimpse into their perspective and finding ways a product to work for their unique homeschool. Well, I have a few questions to get you started. It’s helpful to know how their product is different than the other options that are available. Know that vendors won’t talk badly about another company’s product (or at least they shouldn’t), but they would love to tell you all the aspects of their product that make it unique. What style of homeschooling does this product best fit? I always find it helpful to know what the vendor believes is their homeschool market. This can help me determine if a product will be a good fit for our family. Since I like to use an eclectic mix of products, I’m often looking for a certain styles of homeschool products to keep our curriculum line-up balanced and varied. It is so important to know exactly what subjects are included in each program and how you will need to supplement. I’ve found that not all curriculum is clear and the options can be confusing. Get clarity on exactly what subjects are covered and what other subjects you would still need to purchase. Some programs have lots of extras and supplements. Some of them are recommended and some of them are almost a necessity. I’ve found that I’ve used programs and realized that without “supplement A,” the product simply fell flat. In other cases, I’ve purchased a supplement that I later discovered was really not integral to using the program. So, ask what extras are offered and which ones the vendor feels are necessary. How much time will it take daily/weekly? Oh time! Who has all day to spend on school? Not me! I want to know exactly how much time the vendor believes is ideal to cover the material in each lesson. I always ask how many days per week I would need to use the program and how much time per day I should spend on the lessons. I like to get a good estimate of the time commitment of each program. Does it work well for teaching multiple ages? I have my own little one-room schoolhouse in my homeschool. I’m currently schooling 4 grades with a preschooler and a baby thrown in the mix. I need to combine subjects when possible and I want to find products that allow me to do this. Ask how the vendor believes their product would work with multiple ages. And for the record, if a vendor is trying to convince me that their program covers a massive age-range, then I’m skeptical. Some subjects are just more challenging to combine. So, take their answers with a grain of salt and look through the program yourself to see how it addresses various learning levels. How flexible is this product? Some products have suggested schedules in the manual. However, sometimes it is nearly impossible to rework those schedules if you find that the printed option does not fit your homeschool. Ask if the program has multiple scheduling options, so you can easily fit it into your schedule. And if a program does not have any suggested pacing or schedule, ask what the vendor would recommend. How much planning will it require? This is an important one! Some programs are considered “open and go” with very little planning involved. The product is ready to be used as soon as you open the box. Others require cutting, prepping, or copying before you begin. Find out exactly how many pieces need to be cut out, sorted, glued, or filed away. Your time is valuable, so know the upfront prep work before you commit. Does it require any prep work or teacher training? I absolutely love learning alongside my kids, but I don’t always have time to watch lots of training DVD’s or read giant teacher manuals before I even begin a program. Some programs are unusable unless you’ve done your homework to understand the basics behind the methodology. Find out exactly how much time you will need to spend learning how to teach the curriculum. Is any part of the product reusable? If you have multiple children, this is an important question. I love when parts of a product are not consumable and can be reused for later children. It makes the product a better investment for me because I know that some or all of it will be used many times. Ask what you will need to purchase if you use the program again with another child. Can I speak with a mom who uses the program? Some of the vendors at a convention are moms, not just reps from a company. Ask how she used the program, what a typical day looked like with the program, or what her favorite parts of the program are. Get her personal insight. And if there are no moms at that particular booth, ask if they have moms who use the program that would be willing to contact you. One of the most helpful curriculum conversations I ever had was after I asked a company if I could speak to another homeschool mom who used their products. The next day I received a phone call and we chatted for an hour as I asked all of my questions. What support does the company offer? Some companies offer tremendous support for their products such as phone or email support. I’ve even called one homeschool company and had them walk my daughter through one of the lessons because we were both confused – and that is a service they offer. Others might have training videos or free webinars to help you get started. Find out all the options that will be available to you. Ohh, and don’t forget to find out that final price tag with the convention pricing! You can find some great deals with convention specials. You can do this! You can make eye contact with vendors and walk into their booth armed with questions to help you find a product that will meet your unique homeschooling needs. 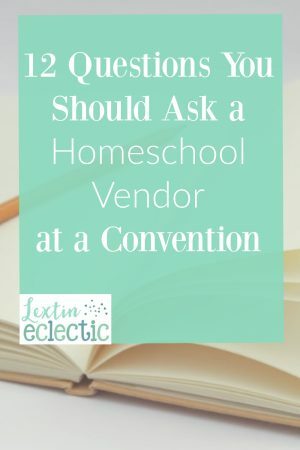 Take your list of questions with you to your next homeschool convention and enjoy approaching vendors. They really are there to help you. They want you to succeed, and if their product is one way to help you achieve success then you both win! Has anyone else been a little intimidated by vendors in the past? Will having a list of questions help you approach them with more confidence? If you’d like to download the list of questions to ask a homeschool vendor you can do that by clicking the button below. Also, visit my other convention planning post for more tips and some helpful convention planning freebies! These are excellent questions to ask! Wendy @ Hip Homeschool Moms recently posted…DEAL ALERT: Who Was Series – Most are 1/2 off! Fantastic points! These are wonderful questions to ask and they certainly will help shoppers get a better idea of the curriculum at which they are looking. I’ve been a vendor as well and honestly it made me laugh when I spotted people who were exactly like me in the curriculum hall–curious but intimidated and doing everything they could to avoid eye contact. The experience certainly helped me learn to approach vendors better and more easily! Again, great points. Thanks for sharing. You’re welcome! I spent too many years afraid of the vendors instead of seeing them as a helpful resource. Now I can be more strategic when I talk to them and I find it worth my time. We homeschool as well, and we also have six children (three boys and three girls). Hopefully the Lord will bless us with more. I have a Marriage God’s Way booth at many homeschool conferences and there are often homeschool curriculum vendors present too. These are good questions to ask them. Scott LaPierre recently posted…Trust the Holy Spirit will help you in marriage!